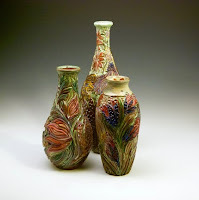 "Greensboro, NC - More than 50 regional potters will participate in the Potters of the Piedmont Pottery Festival on Sat,, Nov, 12 from 10:00am until 4:00pm. Located at the Leonard Recreation Center, 6324 Ballinger Road, Greensboro, NC 27410, a large selection of handmade, functional, decorative, and sculptural pottery from NC, SC, & VA will be available for sale. Founders Molly Lithgo and Jim Rientjes of Earthworks Pottery highlighted the Potters of the Piedmont pottery festival as an extension of their studio show begun in 2002. Their vision of this festival is to showcase local potters as well as those from around the state and beyond. Potters of the Piedmont is proud to partner with Greensboro Urban Ministry’s Feast of Caring and Mosaic-A Lifespan Studio. This year there will be pottery raffle with all proceeds going to Greensboro Urban Ministry. This festival offers the public an opportunity to meet some of the most accomplished regional potters in one accessible location. Ample parking is available; the event is free and open to the public. This event is sponsored by: Earthworks Pottery, Mary’s Antiques, Greensboro Parks and Recreation Dept., Triad City Beat, Cheesecakes by Alex, and Greensboro Urban Ministry.